Ah, the humble sock. It is something many of us take for granted. But for people experiencing homelessness a dry, clean pair of socks can be a small help for getting through the day. Thus, the sock ministry was born at NGCC. We continually collect socks and distribute them in various places: Chapel on the Green in New Haven, Church on the Pond in Hartford, and on the streets of New York City. Guilford Interfaith Ministries encompasses the Guilford Food Bank, Meals on Wheels, and Friendly Visiting-three foundation organizations providing support for the Guilford Community. 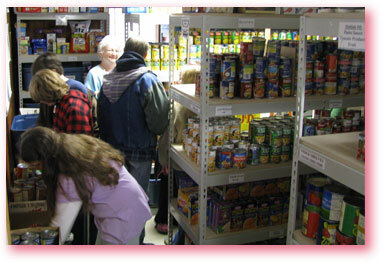 NGCC collects donations for the Food Bank on a weekly basis, as well as running specific food drives. We support Meals on Wheels through our missions funds and through specific collection drives. Columbus House is more than just a hot meal to the homeless of New Haven. Its mission: "to serve people who are homeless or at risk of becoming homeless, by providing shelter and by fostering their personal growth and independence." NGCC cooks, delivers and serves dinner to about 100 people at Columbus House once monthly. You are welcome to join in this life-altering experience. Ask anyone who has been there. 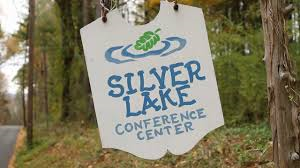 Silver Lake Conference Center is a sacred place where children and adults alike connect with God. Located in Sharon Connecticut, SLCC provides week-long conferences for children of all ages. Our NGCC kids go to "The Lake" every summer, and our congregation is happy to have the opportunity to support it financially. A team from our church helped build one of the newer cabins. NGCC offers scholarships for children who can't afford the full cost. The UCC was founded in 1957, bringing together four denominations. The Connecticut Conference provides support for individual UCC churches in a myriad of ways. Recently they have helped us revitalize our Youth Ministry, work through a period of transitional ministry, and learn about stewardship. Yes, God is Still Speaking, and His voice is heard very clearly through the state and national UCC ministry. Did you ever wonder what the comma means in the UCC logo? It means that God did not stop talking when the Bible was first published. The comma logo was inspired by the Gracie Allen quote, "Never place a period where God has placed a comma." It reminds us to balance our rich religious past with openness to new ideas, new people, and new possibilities of the future.